The Belize Red Cross San Pedro Branch (BRCSP) would like to thank everyone for their support over the course of 2015. 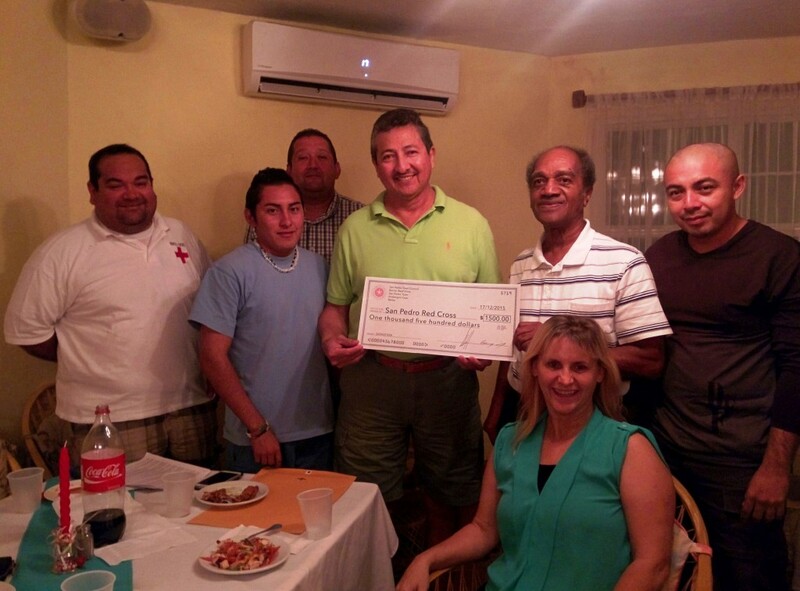 The branch has been working hard in the community to make Ambergris Caye a safer place. 2015 saw several milestones for BRCSP and as such they would like to share them with the community. 2015 brought the First Aid/ Cardiopulmonary resuscitation (FA/CPR) training to a new level, with the certification of an instructor who lives on the island. Ashty Dennison is currently the only FA/CPR instructor certified by Belize Red Cross on San Pedro, while Martin Dawson is our certified assistant. In addition, this year, 64 people were trained in six sessions of FA/CPR workshops; six businesses, two schools, three private citizens and two new Red Cross volunteers. Since BRCSP re-inception in 2013, 263 have been trained from 46 businesses and two lives have been saved thanks to FA/CPR, both were children. In 2015 BRCSP was represented at three events this year; the 5k walk for Mental Health Awareness, Lobster Fest and the Saga Halloween party. “At these events, members gave out plenty of water, and administered bandages to a couple of blistered heels and ice for a hurt knee. The most popular activity at the stations has been blood pressure checking,” said BRCSP. BRCSP also reports successful blood drives for 2015. Blood drive Coordinator Sue Barkhouse successfully planned and executed three blood drives in 2015 with 100 pints of blood collected. Four blood drives to to be scheduled for 2016. Members of the BRCSP attended several trainings in the in 2015 including the Resource Mobilization Training attended by Ashty Dennison, Sue Barkhouse and Wendy Alter; the Street Meditation Training attended by Shirlee Arnould; the First Aid Instructor Training attended by Ashty Dennison and Martin Dawson; and the Street Beat Follow Up Training attended by Shirlee Arnould and Laurie Norton. Training opportunities come from Belize Red Cross Headquarters and as such the BRCSP always sends volunteers subject to availability and interest. In 2015, BRCSP hosted four volunteer groups who were in the island carrying out projects and events: the Texas A&M group, which was here from March 14 to 21, 2015, learning more about tropical diseases and conditions; the Florida Association for Volunteer Action in the Caribbean and the Americas (FAVACA) which was here from March 26 to 28, 2015 and June 13 to 21, 2015 carrying out a comprehensive assessment of San Mateo in order for the Belize Red Cross to use in applying for grants to fix the infrastructure of this area so it would no longer be a threat to the people and environment; Sperro group, which was here from June 5 to 8, 2015 and organized a food drive for the island’s less fortunate; and the United Methodist Church of Johnstown Colorado group from June 4 to 25, 2015, which assisted the Ambergris Caye Elementary School in renovating the school’s facilities. In 2016, BRCSP will be hosting a dental group that will be working at the Dr. Otto Rodriguez San Pedro Polyclinic in April, 2016. Finally, BRCSP reports a total of $3,100 raised through donations. This money was used to assist the community through the works BRCSP does. BRCSP would like to extend a special thanks to Mayor Daniel Guerrero for attending the Red Cross Christmas Party and making a donation of $1,500 for the group to start activities in 2016. Big thanks also goes out to everyone who assisted and supported them throughout 2015.